Our Journey begins long before we are born. 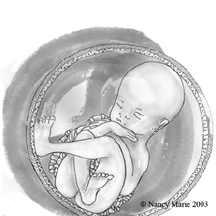 Like a seed buried deep within the ground we carry potential in the womb. At the same time, our mother’s thoughts and experiences are chemically passed to us and these experiences affect the development of our body, mind, and potential. Did she feel loved and supported or did she feel unloved, frightened, or overwhelmed by life? Did she feel capable of creating what she wants and needs or did she feel held back or inadequate? Was her relationship with her child’s father filled with love, hope, and potential? Or was it filled with, judgment, unresolved anger, and bitterness? Research shows that the emotional state of the pregnant mother can have both immediate and long-term effects on her offspring. Maternal stress and anxiety during pregnancy has been linked to infant outcomes such as increased fussiness problems, attention regulation, emotional reactivity, and lower scores on measures of mental development. It has also been associated with hyperactivity, inattention, and emotional and behavioral problems later in life. Since there are no direct neural pathways between the mother and fetus, scientists have looked for more indirect pathways to understand how a mother’s level of stress and anxiety may impact her baby. One avenue that has been explored is that of stress hormones. When we are stressed, a series of chemical changes is set off in our bodies and brains, such as the release of cortisol and adrenaline. Normally, these chemicals help prepare us for danger and are important for our survival; however, if we are chronically stressed and anxious, these stress-related hormones can remain high for too long and wreak havoc on our bodies. When a pregnant woman is chronically stressed or experiences extreme stress, the baby may be exposed to unhealthy levels of stress hormones, which can impact the baby’s brain development. Chronic or extreme maternal stress may also cause changes in the blood flow to the baby, making it difficult to carry oxygen and other important nutrients to the baby’s developing organs. So how can we counteract this problem during pregnancy and/or how can we resolve the damage much later in life? The simple answer is finding ways to reduce stress and restore balance in our body and mind. The ICWIB program is the outgrowth of my own personal healing. As a child dealing with prenatal drug exposure, abuse, and related brain dysfunction, it would have been very difficult for me to succeed without these tools. With this in mind, I invite you and the children in your life to explore some of the ICWIB activities and videos for FREE because they can help you reduce stress, restore balance and create a life that is truly supportive of your authentic nature.